Have you ever wondered what it takes to be a beekeeper, or what the benefits are to your homestead if you choose to raise bees? I am lucky enough to have a few friends who are bee keepers and are lovely enough to answer questions about it. I wrote in the first installment of my “Bee Series” about what you can do to help save the bees. You can read about it here. In this second installment, I share the benefits of raising bees on your ranch. It’s not about just being able to wear really cool bee keeping suits! As a teenager, the father of one of my best friend’s raised bees. She used to drive around and point out the large cluster of white boxes under oak trees that were his hives I always thought it was the coolest thing ever, but remained super intimidated! I remember watching Fried Green Tomatoes as a child and loved Idgie, the “bee charmer”, who would harvest fresh honey and combs without any safety gear on. I thought of her as a rock star, although she was fictional. Fast forward to when we moved to our ranch. My husband and I were discussing what we would like to do with our property, knowing that we want to ultimately plant an orchard. So many people suggested raising bees in order to help nurture our land and plants, that we began looking into it. The benefits of bee raising far outweigh the cost and time requirements in keeping them. We had high hopes of becoming bee keepers this spring. This is until our barn burned down. Click here to read THAT story! We are hesitant to become bee keeper’s due to the barn rebuilding that we hope will take place this summer and into autumn. Bees need to have a calm and low stress environment or they will swarm, or even worse, leave. As badly as I want them, I feel like with any other pet you adopt, it is your responsibility to ensure they have the best environment and lifestyle possible to be happy. If we adopted bees now, I feel like it would be doing them a disservice. So, I guess we will sadly be waiting another year. However, I wanted to share why we are so excited to eventually become beekeepers. Raising bees is a way to contribute to your environment and community, especially if you live in an agricultural town. Your bees can travel up to two miles around your home searching for plants to pollinate. Your orchard growing neighbors and lavender farming neighbors alike will benefit from your bees buzzing around the ‘hood. Bees benefit your garden tremendously. My friends who raise their own bees have the most incredible harvest seasons from their gardens, as the bees are constantly seeking to pollinate their plants. Not only do they have increased levels of produce, their fruits and vegetables are large, healthy and beautiful. 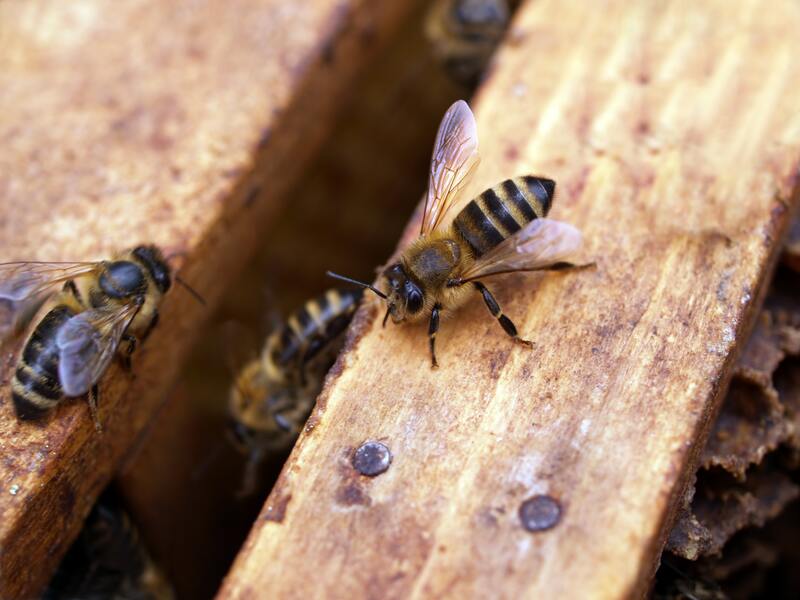 They contribute this success to their secret weapon…their bees! Raising bees obviously has a positive impact on the diminishing bee population. Our world is suffering by not having enough bees to pollinate our fruits and vegetables. By providing them a safe haven, a place to thrive and live, bees are able to do their “jobs” for our agricultural efforts, which our human population is dependent upon. I think the number one thing we all think of when it comes to bees is the honey! I am quite honey obsessed myself. Harvesting honey from my own backyard twice a year sounds like Heaven to me. I have some crazy allergy problems, and have really noticed when using local honey on a regular basis, my allergy problems diminish. The honeycombs and wax bees create is also beneficial. The wax can be used to make homemade goods like candles, lip balm and other beauty products. Thank you so much for the support! I love little busy bees too!